CHASSIS: To heighten the highly energized riding experience of a 125cc 2-stroke, KTM developed a new chassis that is light and responsive enough to enhance its dynamic reputation. 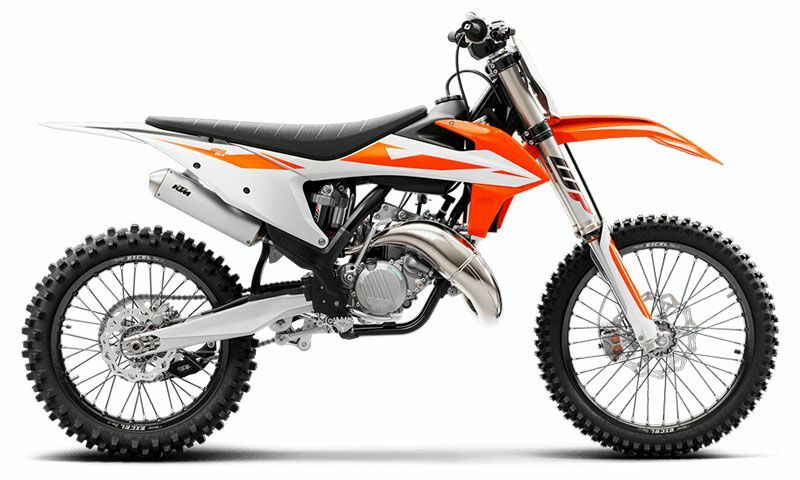 For 2019, the KTM 125 SX features a new lightweight, high-tech steel frame that not only responds accurately to rider input, but has also been optimized for better rider feedback. The new flex characteristics help the bike to soak up those big hits while also delivering excellent agility and high-speed stability. As a whole, this new chassis allows the rider to be 100% in charge of the ride. FRAME: The high-tech, lightweight chrome-moly steel frame has a knack for easy handling, outlandish rideability, precise cornering and excellent stability. You can also count on high torsional rigidity and low longitudinal stiffness. This results in better absorption of the energy created from the front and rear suspension, sucking up jumps and bumps. In short: more comfort and less rider fatigue. Laterally attached, engine head stays (the connection between cylinder head and frame) are now made of lightweight aluminum. They contribute to more precise cornering and a reduced vibration level. The engineers were able to pull off all that, while making their frame 2.2 pounds lighter than that of the lightest competitor on the market. In addition, it is easier to maintain, easier to work on and supplies more space for the tank and other components. The bike also features an extra-light subframe made of aluminum, which tiptoes the scales at less than 2 pounds. ENGINE & EXHAUST: The latest version of the 125 SX engine is once again the most competitive and powerful engine in its class. With an outstanding power-to-weight ratio, low cost and overall simplicity, it is clear that 2-strokes will continue to have a successful future at KTM. The compact and durable 17.2 kg engine was developed using the latest KTM engineering know-how, resulting in broad power across the rev range. Its easy rideability and outstanding performance are benefits that equate to faster lap times and better results. CRANKCASES AND ENGINE COVERS: For the latest engine generation the KTM engineers designed lightweight die-cast engine cases featuring a high crankshaft position located close to the center of gravity, which results in optimal mass centralization and outstanding rideability.